Regardless of what the weather’s been like in your neck of the woods, our tagged snowy owls know that spring is here — and this past week, a bunch of them started responding to the season. In our last post we discussed some hints of the season, including Hardscrabble’s sudden departure from his traditional winter territory in southern Ontario (and our concern that the last place from which he’d checked in was the middle of a military airfield in New York). He’s fine — March 23-24 he was on the ice around Wolfe Island and Kingston, ON, then headed back north toward Ottawa. By daybreak this morning he was on the frozen Ottawa River, just west of Ottawa itself, having scribed a big loop covering 400 km (250 miles). Tuesday evening, March 26, Dan and Pat LaFortune tracked him down for us and got this photo of our boy roosting in a cornfield. 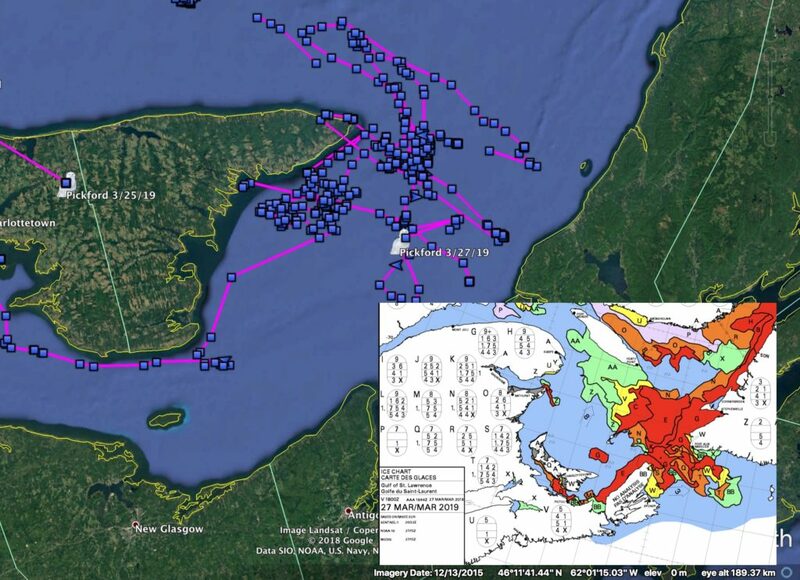 Admittedly, some of our flock are staying put — Otter around the outflow of Lake Ontario into the St. Lawrence, Island Beach near Montreal, and Wells in Quebec City. Over on Prince Edward Island, Pickford was forced onto land for several days by melting sea ice, though by March 27 she’d moved out into the strait between PEI and Cape Breton Island where some ice still remains. But other owls are moving a whole lot farther and faster. Seneca, for example, has migrated 280 miles (450 km) almost due west from central New York. After skirting the Rochester, NY, suburbs, he flew west to the Niagara River and south past the Buffalo waterfront on March 22, then moved out onto eastern Lake Erie, which still has a fair bit of ice. Once he left the ice, though, he moved quickly west along the northern shore of the lake, and on March 26 was floating on some small floes south of Elgin County, ON. 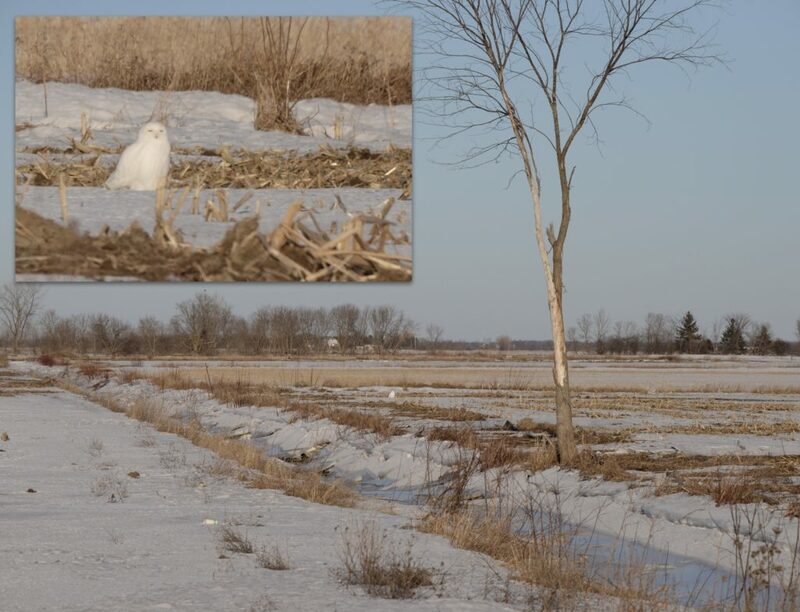 Three of our four Midwestern and western owls also hit the road this past week. 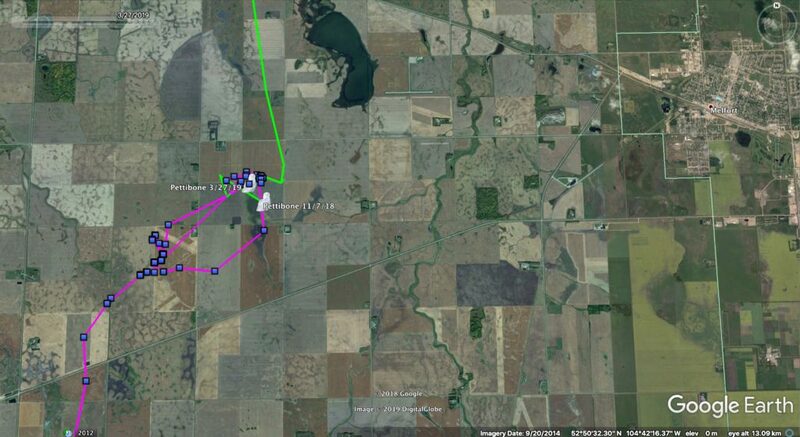 Plainfield, who had been relocated from an airport to the ag fields and grasslands of central Wisconsin, flew 250 miles (400 km) northwest, out of Wisconsin, and by March 24 was in Pine County, Minnesota, just north of the town of Sandstone. 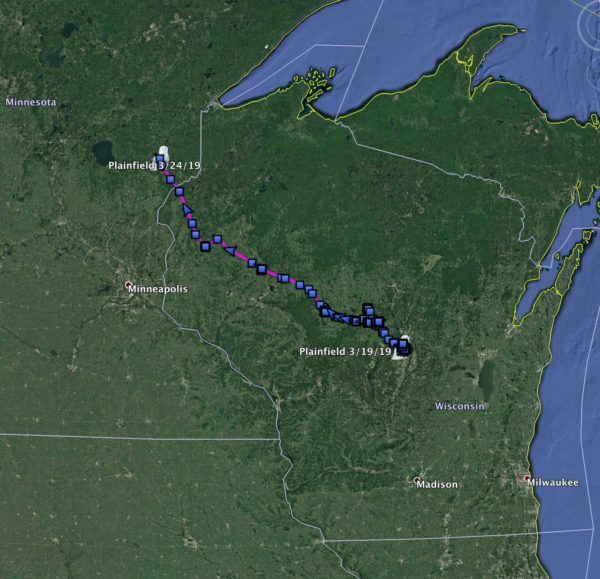 Argus, who had been moving north from southwestern Minnesota, hasn’t checked in since March 21, presumably because he’s not had good reception. the day he first checked in after returning south. The cellular coverage gets decidedly sparse north of there, once Pettibone leaves the prairies and hits the vast boreal forest, but there are scattered towers at small communities all the way to the Arctic, so we’ll have to hope he swings past one or two on his way north. All this activity may seem surprising — after all, some years many of our tagged owls linger south well in April, and even into May. But those late-departing birds are usually juveniles, not old enough to breed. Most of the owls we’re following this winter are full adults, at least four or five years old. Especially for males like Seneca, Pettibone and Hardscrabble, there’s a tyranny of the calendar that pushes them to head north early, locate an area with lots of lemmings (if they can) and set up a territory so they’re positioned to intercept a female looking for a mate. (Unlike many raptors, snowy owls do not appear to maintain pair bonds from one year to the next.) Because lemming numbers fluctuate from year to year, the owls can be quite nomadic from one breeding season to the next. Pettibone was in the western Canadian Arctic on Banks Island last summer — he could wind up thousands of kilometers from there this year, depending on prey conditions. My wife got some great pics of a very large adult male last week. Her weekly commute is Ada-Crookston where she works as a pharm tech. Some other pics of adult females also. Said she didn’t notice “backpacks” on any of them. Fairly lonely terrain here in NW Minnesota and good hunting grounds- plenty of rabbits, ruffed grouse, prairie chickens, and Hungarian (gray) partridge. Usually sees them atop power poles or sitting in fields. I don’t think she’s seen any having lunch this winter. Sparrow hawks (Am. Kestrels) are returning, a sure sign of meteorological spring here, along with our basement sump pumps running ! thanks for your blurb, Mike. everything here is really interesting this time of year! !